Suzanne, you had us at "prosciutto." That's right, the celebrated Lucques and AOC chef, Suzanne Goin, led us on to this new family staple. We made her Prosciutto and Grilled Asparagus with Whole Grain Mustard from her Sunday Supper cookbook recently for dinner. Loved, loved the flavors! Doesn't bacon (or its cousins) make everything better? Absolutely! The best part of all is the Whole Grain Mustard sauce, which happens to be delicious with a variety of veggies. My daughter and I also had fun dipping long string beans (green or yellow) into the sauce for a snack. To make it healthier, we swapped the creme fraiche for plain yogurt (see pictured). 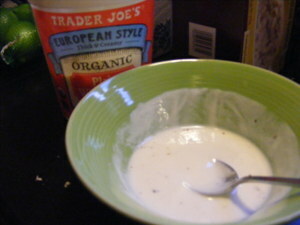 1/2 cup of plain European Style yogurt (or creme fraiche). You just want to make sure that it is not the lumpy kind of yogurt. European Style is smooth and creamy. To make the whole dish: Get your grill fired up about 30 - 40 min before you are ready to cook. (You can also saute here instead). Snap the ends off the asparagus to remove the tough woody portion. Toss the asparagus on a baking sheet with olive oil, 1/2 tsp. salt and some pepper. Stir the mustard and yogurt together in a small bowl. Set aside. With the prosciutto, you have one of two options. You can drape it on the plate as is (as Suzanne suggests) or you can saute it first until it starts to get a little brown and crispy (my preference, esp. since I am pregnant). Our daughter sure took to the prosciutto!! Grill the asparagus for 2-3 minutes until slightly charred and tender. Arrange the asparagus on the prosciutto and drizzle the mustard sauce on top. Blogging here from fabulous Cabo San Lucas as I stuff my face with loads of guacamole and chips. Probably the best guacamole of my life. I know I have gained about 5 pounds just today. At least it is all GOOD fat. Ha! I've had the pleasure of learning a few cooking tips from famous chef Nigel Field, who cooks for guests at the Palmilla resort in Cabo. With rather impressive crudentials, he has cooked for presidents, royalty and a fair share of famous people. He was even the lead chef at Princess Diana's wedding at a ripe age of 25. While watching his wief Mercedes make guacamole, Nigel gave me some pointers. He likes to use Mihoucan avocados for his guacamole. And it is all about keeping it pure.....just 4 - 5 avocados, diced white onion, diced cilantro, diced serrano peppers, fresh lime juice, dash of cumin and salt. Folks, you really have to dice and mince finely to get the full effect. So simple. So good. Since Mihoucan is not one of the California avocado varieties, I have included a link to a handy avocado guide. Go with Haas as your first choice and Gwen as the backup for making guacamole. Often, the Americanized version of guacamole ends up with too much other stuff in it. Many times it is really good, but this was just amazing. From now on, I'm going with the purist approach. Agave Nectar: It's my new favorite sweetner. All natural and it has a low glycemic index. If you are trying to cut calories, you can use this in place of sugar or honey. I've been putting this in my tea and oatmeal on a daily basis since I picked some up at the Nature Mart. Leftover Cranberry Sauce?? Make a Salsa! In honor of our Southwestern Thanksgiving, I made this cranberry salsa, which turned out to be the hit of the dinner. If you have any leftover jars of cranberry sauce kickin' around, this is a good way to use it up. (I'm making my grandma, Bootsie, proud here as she always says, "use it up, wear it out, make it do or do without"). This recipe is best if you make it the day before. You can serve it with green (if you can find them. I have no idea where) or blue tortilla chips. How festive is that!! Mix all of the above in a bowl and refrigerate overnight. May be kept in the fridge for up to 1 week. Got leftover turkey? Use the cranberry salsa to spice up your turkey sandwich or make some turkey tacos. Move over basil, spinach is the new green in pesto! Sorry basil, we really do love you and all. There are just a lot of other produce and herbs out there that are pestoworthy. Some are just flat out healthier than you. No offense. Last night, we decided to give spinach pesto a whirl in the mini prep, and it was a hit with the whole family. Very easy and healthy! Place all ingredients into food processor and process to a fine paste. Taste and adjust seasonings and transfer to a glass container and top with a thin coat of olive oil to prevent the top of the pesto from discoloring. Keeps for weeks in the refrigerator. For our dinner, we ate the pesto over fusili pasta with diced heirloom cherry tomatoes. For the little one, I served the pesto with the same pasta, but melted mozzarella cheese on top. 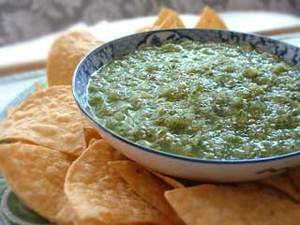 Salsa verde or as we call it in Texas "green sauce" is muy delicioso on chips, enchiladas, grilled fish / meat and eggs, to name a few. We've always wanted to make it ourselves, but have been a tad intimidated with handling tomatillos. Today, we mustered up the courage and bought a bunch of the little green, tomato-like fruit at the Hollywood Farmers' Market. Did our research and discovered an easy salsa verde recipe on Simply Recipes. So easy that I feel so foolish for avoiding an attempt at it for so long....think of all of the enchiladas I've missed out on. We ate this salsa verde on grilled flank steak and sauteed polenta (from TJ's), and everyone was asking for more sauce. My husband shouted to me from the table, "Sweets, I think we found a new condiment!" You're thinking we are total nerds, aren't you?? Or maybe you just have condiment envy?